Creditable service is one of the factors used to calculate the amount of a member’s retirement benefit. It is also determines whether a member is vested. A member will become vested upon reaching ten (10) years of creditable service. Vesting enables a member who becomes inactive to leave his or her retirement deductions on deposit with the retirement system in order to qualify for a retirement allowance upon attaining age fifty-five (55) or greater. Members are credited with one year of service for each year of employment of not less than 30 hours per week, or a yearly proportion thereof. If the member’s hours of employment fall below 20 hours per week, members are credited with a yearly proportion thereof. Authorized leaves of absence may be applied toward your creditable service. The credit received is based on the length of the leave and the amount of compensation received by the member in accordance with Massachusetts General Law. If a member leaves his or her job and goes to work for another governmental unit which comes under the provisions of Massachusetts General Laws Chapter 32, his or her creditable service will be transferred from the other retirement system to Dukes County Contributory Retirement System. Such service will be added to service rendered in the Dukes County Contributory Retirement System to determine vesting. 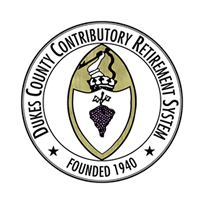 Members-in-service may be eligible to purchase service rendered prior to establishing membership with the Dukes County Contributory Retirement System. Such service will be added to service rendered in the Dukes County Contributory Retirement System to determine vesting. Veterans can purchase up to four years of retirement credit for their active military service. National Guard and Reserve time is pro-rated on a 5 to 1 basis. For every 5 years of Guard and Reserve service, a member will receive 1 year of credit. The cost of this service is 10% of a member’s first year salary (upon entering the retirement system) for each year purchased. No interest is charged for the first year. Members may rollover funds from deferred compensation or tax-deferred plans with no penalties to purchase this time. In addition, installment payment plans are available. If a member previously rendered public service, and then left and took a refund of his or her annuity savings account, the prior service credit may be bought back. There is no limit on the amount of time that can be purchased. Actuarial interest rates will apply. There is an exception, however. If a member establishes membership in a Massachusetts contributory retirement system on or after April 2, 2012, and had been a member previously and taken a refund, the member will have one year from the date he or she re-entered public service to apply and pay for the service at a lower buyback interest rate. After one year of re-entry to membership, however, the member will be subject to the higher actuarial interest rate.